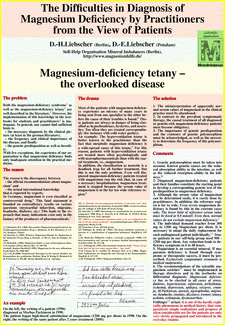 Magnesium-deficiency tetany is a mostly overlooked disease. It is necessary to sensitise the practitioner for all signs of magnesium deficiency and to implement causal magnesium therapy in handbooks and directives. the genetic predisposition as well as heredity. Magnesium deficiency is defined as an electrolyte metabolic disorder. Although dramatic courses of the disease early in the life are described (in extreme cases the implications of magnesium deficiency are so severe that newborn children would die without high-dosed magnesium therapy ), magnesium deficiency is often regarded as a risk factor only and not as the reason of illness. In addition, almost nothing is known among the practitioners about the existence and prevalence of the genetically determined magnesium deficiency. With few exceptions, the experience of the self-help organisation shows that magnesium deficiency finds only inadequate attention in the practical medicine. the actual international knowledge that is reported by experts. There are statements about magnesium that openly contradict expertise. In Germany, magnesium is even classified as controversial medicine . This fatal statement is founded on apparently contradictory results on various questions (myocardial infarction, migraine, headache, diabetes, etc.) This leads to the reproach that many indications exist only in the fantasy of the producers of pharmaceuticals . Most of the patients with magnesium deficiency experience an odyssey of many years in being sent from one specialist to the other before the cause of their troubles is found . These patients are always in danger of being classified as hypochondriacs, hysterics, and neurotics. Too often they are correspondingly treated (for instance with cold water gushes). An example: The hyperventilation tetany is better known to the practitioner than the fact that metabolic magnesium deficiency is a wide-spread cause of this tetany . For this reason, patients with hyperventilation tetany are treated more often psychologically and with neuro-pharmaceuticals than with the causal treatment with magnesium instead. In addition, the classification as neurotic is a deadlock trap for all further treatment. But this is not the only problem. Even well diagnosed magnesium-deficiency patients treated with magnesium run the risk that, in case of a necessary hospitalisation, magnesium treatment is stopped because the serum value of magnesium is in the far too wide reference region . This can lead to severe consequences that, nevertheless, are only reluctantly accepted as consequences of magnesium deficiency. The experience of the members of the self-help organisation is that, usually, the illness is diagnosed only 10 to 20 years after the first signs, if the disease is diagnosed at all. Apparently, the reason for that is that the clinical picture of the magnesium-deficiency tetany or the magnesium-deficiency syndrome plays only an insufficient role in medical education. In addition, the prevalence of magnesium deficiency is underestimated. In many manuals the status of magnesium deficiency is described to be very rare. However, it is not rare, and in the differential diagnosis of many illnesses you have to rule it out! In addition, the picture of the magnesium-deficiency syndrome can change during life, and the patient consults different practitioners, the result is an underestimation of the case history. 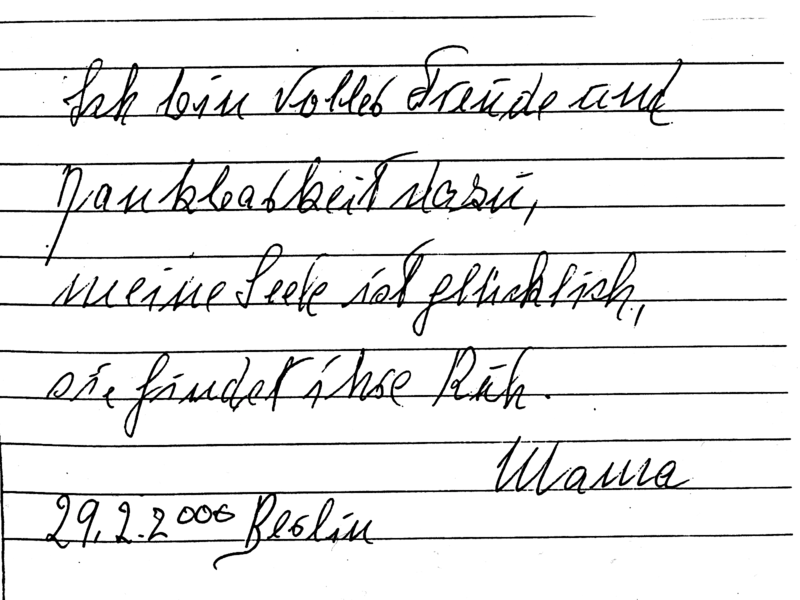 On the left, the writing of a patient (1996) diagnosed as Morbus Parkinson in 1990. The patient began high-dosed substitution of magnesium (1200 mg per diem) in 1998. 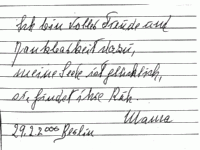 On the right, the writing of the same patient after 2 years treatment (2000). The misinterpretation of apparently normal serum values of magnesium in the clinical practice must be abandoned. In contrast to the prevalent symptomatic therapy, the causal treatment of all diagnosed or genetic-risk magnesium-deficiency patients must become obligatory. The importance of genetic predisposition in combination with an existing genetic polymorphism must be acknowledged, as well as the necessity to determine the frequency of this polymorphism. Genetic polymorphism must be taken into account. Known genetic causes are the reduced absorption ability in the intestine, as well as the reduced resorption ability in the kidneys  . Systematic genetic studies on cohorts or risk groups are not yet performed. An important evidence could be given by a genetic test in risk families and risk groups. Already diagnosed families, as in the Self-Help Organisation could help to establish such a test of the predisposition to magnesium deficiency. Interested scientists are invited to contact us. The magnesium serum value is often regarded as a diagnostic criterion to exclude the deficiency. But this value is not routinely estimated by practitioners. If this value is investigated at all, it is insufficiently recognised, that in 50% of the cases a clinical magnesium deficiency status is present in spite of an estimated normomagnesemia. Last but not least, the reference value varies from author to author. No general recommendations exist that the magnesium total serum value should be 0,9 mmol/l in case of trouble or disease. Although the serum value of magnesium can be determined easily, it is rarely done by practitioners. A magnesium loading test is not used by practitioners. As we have seen, the reference region is far to wide: Even severe magnesium deficiency is found by this test in extreme cases only. That is because serum magnesium contributes only 1% to the cationic content of the body although it is the second abundant cation in the cell. The lower limit of reference serum value must be fixed at 0.8 mmol/l. Even then, normal values do not exclude magnesium deficiency . The individual demand reaches from 300 mg to 1200 mg Magnesium per diem. It is necessary to adapt the daily replacement for each undiagnosed patient individually . Tetany patients in the self-help organisation need 900 - 1200 mg per diem. Any reduction leads to deficiency symptoms in 6 to 48 hours. We suppose that a genetic polymorphism is the cause of the large differences of the needed quantity of magnesium. Such a polymorphism can only be found in genetic studies. Magnesium is an essential mineral. If magnesium deficiency is found through symptoms or therapeutic success, it must be prescribed. Exclusively symptomatic treatment is medical malpractice. The recommendations of the scientific magnesium societies  must be implemented in therapy directives and in the textbooks on differential diagnosis: Magnesium deficiency has to be checked in all cases of stress, diabetes mellitus, circulatory disturbances (stroke, cardiac infarction, atherosclerosis), hypertension, arrhythmia, ischemia, depression, epilepsy, seizures, crampi, M.Parkinson, anxiety, agoraphobia, migraine, cluster headache, tinnitus, ataxia, confusion, dizziness, tremor, tetany, asthma, eclampsia, dysmenorrhoe, neuro-vegetative disorders, abdomial pain, osteoporosis. Neurologists and psychiatrists in particular must test magnesium deficiency. 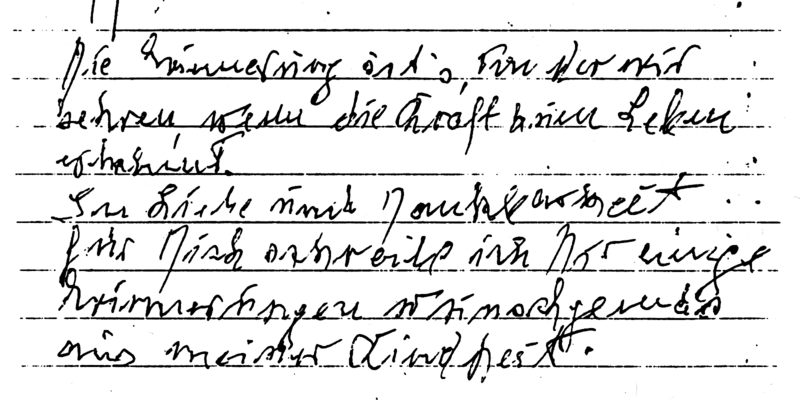 For them it is simple to see the effect of a tentative magnesium therapy by watching the change in handwriting . Fehlinger wrote with respect to magnesium therapy: It is one of the hardly explicable phenomena in medical history that comparatively simple realisations and progress of often considerable use for the patients are only very slowly propagated and introduced in the everyday routine. Apparently, one obstructing factor is the mere simplicity of the new methods that are comparable to the recommended by Semmelweiss method of washing the hands to limit the childbed fever, a method attacked at its time even by Virchow . Holtmeier, H.J. (1968): Das primäre Magnesiummangel-Syndrom. In: Ernährungswissenschaften, Hrsg. L. Heilmeyer and H.J. Holtmeier, S. 111-151. Stuttgart: Thieme. Durlach, J. (1992): Primärer Magnesium-Mangel. In: Magnesium in der klinischen Praxis, Hrsg. J. Durlach, S. 80-111. Jena/Stuttgart: Fischer. Rude, R.K. (1998): Magnesium deficit: a cause of heterogeneous disease in humans, J. Bone Mineral Res. 13, 749-758. Swain, R. and Kaplan-Machlis, B. (1999): Magnesium for the next millennium, South. Med. J. 92, 1040-1047. Fehlinger, R. (1990): Therapy with magnesium salts in neurological diseases, Magnesium Bull. 12, 35-42. Fauk, D. and Fehlinger, R. (1987): Transitorische zerebral-ischämische Attacken (TIA) vor dem 50. Lebensjahr - klinische Untersuchungen, Z. Klin. Med. 42, 2053-2057. Csef, H. (2000): Somatoforme Störungen in der inneren Medizin. In: Kompendium der praktischen Medizin, Hrsg. B. König, D. Reinhardt, and H.-P. Schuster. S. 393-402. Berlin, Heidelberg et al. : Springer. Shalev, H., Phillip, M., Galil, A., Carmi, R., and Landau, D. (1998): Clinical presentation and outcome in primary familial hypomagnesaemia, Arch. Dis. Child. 78, 127-130. Arzneimittelkommission der deutschen Ärzteschaft (2000): Arzneiverordnungen (19. Auflage), S. 629. Köln: Dt. Ärzte-Verlag. Schwabe, U. (1999): Bewertung von Arzneimitteln. In: Arzneiverordnungsreport 1998, Hrsg. U. Schwabe and D. Paffrath., S. 579-615. Berlin, Heidelberg et al. : Springer. Arzneimitteltelegramm (1997): Positivtelegramm. Berlin, S.126. Experience of the self-help organisation. Fehlinger, R. and Seidel, K. (1985): The hyperventilation syndrome: a neurosis or a manifestation of magnesium imbalance? Mag. Bull.4, 129-136. Fehlinger, R. (1991): Zur Familiaritäat des tetanischen Syndroms, Magnesium Bulletin 13(2), 53-57. Classen, H.G., Achilles, W., Bachem, M.G. et al. (1986): Magnesium: Indikationen zur Diagnostik und Therapie in der Humanmedizin. Mag. Bull. 8, 127-135.